Before I get started, for those of you who are wannabe readers but are not currently in the Word, please find a link below to create your own reading plan. And also, will you please let me know that you’ll follow a plan by replying to this message with a simple “I’ll follow a plan”? Psalm 119: 34 Give me understanding and I will obey Your instructions; I will put them into practice with all my heart. Let’s face it, the Bible is massive, compared to most books anyway. To the uninitiated, the thought of reading through it is daunting. This is no surprise; after all, it includes 66 books which contain 1189 chapters! Where does one start? How do you know what you should read next? These thoughts and related questions used to haunt me. I’d have enough guilt that finally the idea came to me to just read the book of Romans. So I made an attempt to read Paul’s letter to the Romans. That worked out for a little while. I started to read it daily but got busy and I’d skip a day here and there, no big deal, right? I’d eventually finish the book, but with little momentum. Then I’d think to myself “What’s next?”. I’d eventually pick another book, days later, and “attack” it in the same manner, which was not with a whole lot of zeal. 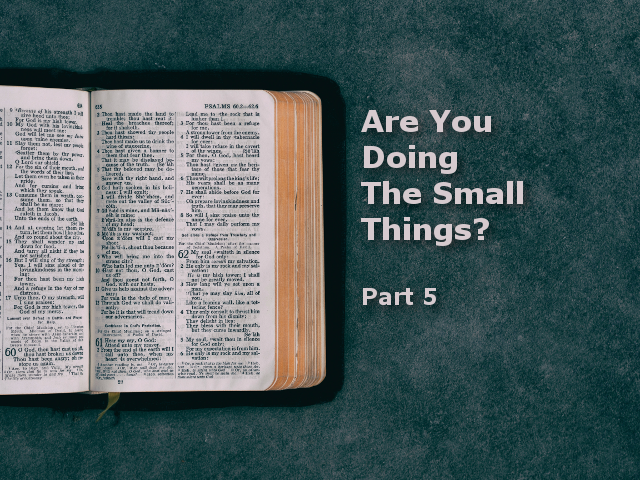 My Bible reading habit mirrored my faith, which was lukewarm. Revelation 3: 15 “I know all the things you do, that you are neither hot nor cold. I wish that you were one or the other! 16 But since you are like lukewarm water, neither hot nor cold, I will spit you out of my mouth! This is not a good verse to identify with, but that’s where I was. I had no real eagerness to read the Good Book, nor did I have any consistency. Now that I look back on it, of course, I wasn’t very eager, I wasn’t planted in very good soil. A big reason is that there was no one to coach me or inspire me enough to get me started, but was I ready to listen anyway? Were these just excuses? They were and I knew better. In my heart, I was convicted about reading the Bible. I knew that I should’ve been reading His Word. Besides these excuses, I was labeled a “slow reader” in middle school and that was a big deterrent for me. “I’m not much of a reader.” I’d say to myself. I allowed my past to dictate my present. Although I might read through a book or two, I’d lose momentum, and the “worries of this life and the lure of wealth” (Matthew 13:22) would stifle my reading altogether. The Christian faith is not for spectators. It is one that requires participation if any growth is to be expected. To follow Jesus with my whole heart requires all of me, just as the greatest commandment states: “all your heart and with all your soul and with all your strength and with all your mind” (Luke 10:27). The effort put forth into seeking Him wholeheartedly is not easy, but it is incredibly and indescribably rewarding. The joy, the security, the sense of purpose, the sense of belonging and the unnatural peace are benefits that cannot be overrated. John 4: 36 The harvesters are paid good wages, and the fruit they harvest is people brought to eternal life. What joy awaits both the planter and the harvester alike! These benefits are greatly undervalued by the world, but what do they know anyway? The world is trying to tell us that if we only won the Lotto everything would be great, while the God of all creation is telling us to forsake everything and follow Him. Reading the Holy Scriptures cannot be overemphasized. I really hate to say “You have to read the Bible.” But tell me this, how else will you gain an understanding of God as the verse in Psalm 119 started us off? If you desire a “close fellowship” with Him, there are no shortcuts. Relying on sermons and second-hand, processed scripture found in devotionals (like this message) and the latest “Christian Best Seller” is not good enough. While there are powerful devotionals and great Christian books, they are not adequate substitutes for God’s personal Message. The Bible is raw, unfiltered and organic. It was not written to appeal to all readers and be easily understood by just anyone. He reveals Himself only to those who sincerely seek Him. Hebrews 11: 6 And it is impossible to please God without faith. Anyone who wants to come to him must believe that God exists and that he rewards those who sincerely seek him. Do you realize that there are Christians in remote parts of the world that would do anything to get their hands on the Bible? While here in the States, we have any number of Bibles lying around the house simply collecting dust. What’s wrong with this picture? In those remote Countries, they are willing to die for their faith, while we (the majority of self-proclaimed, North American believers) are not willing to give 15 minutes a day to get closer to God. Talk is cheap. thirteen years ago I knew all the right words to say and knew enough about God that I could’ve fooled anyone to think I was a believer, but my heart was not in it. I didn’t really understand God, much less know how to love Him. It’s never just about our intellectual knowledge of Him. While this type of knowledge is an asset, what really matters is where our heart is. But the heart is not something we can change, that is His job when we give ourselves to Him. This is the Divine Partnership. He calls us, like when He gave you the idea to read this message, and you responded by reading it. He put it on your heart and you responded. These words are promoting Him and prompting you to get to know Him better. The question now becomes “How will you respond to this message?”. You can delete it and forget it, you can “repent of your sins and turn to God” (Matt. 4:17), or say “I think I’ll forward this to my friend who seems to be straying from God, as for me I’ll keep on reading the Word.”. He calls on us daily to reach out to Him for fellowship. “Will we respond and how?” is the question we each have to ask ourselves. This partnership is meant to grow and develop into something beautiful, precious and fruitful, both for us and for His Kingdom. He actually takes pleasure when we move towards Him, it is mutually beneficial, which is really cool when you think about it. Genesis 5: 23 Enoch lived 365 years, 24 walking in close fellowship with God. Then one day he disappeared, because God took him. If you are content with your relationship with Him, then maybe you’re reading enough. How much is enough? That depends on where you’re at and where your conviction lies. I can’t tell you how much is enough. For me, I personally cannot get enough, but I am where He has led me and this was not my doing. I gave my heart to Him and He’s changed it dramatically since the time I was indifferent, about thirteen years ago. I once was lukewarm, but now I’m passionate! Although I knew Jesus and was introduced to Him as a child, I’ve grown more in Him these last thirteen years than the entire 38 years prior. He put it on my heart, late in 2006 to read through His Word in 2007. I responded and never looked back. He took me from a place of indifference to a place of being consumed by Him. He has truly turned my life upside-down and I am eternally grateful for that. I haven’t got it all figured out, my life is not “perfect” by any stretch of the imagination, but I know in my heart that God is really good. I’m learning the secret, just as Paul did, about being content in any given situation. Just when I find myself losing my peace due to a change or disappointment, I’ve learned how to go to Him and find peace regardless of the situation. Philippians 4: 12 I know how to live on almost nothing or with everything. I have learned the secret of living in every situation, whether it is with a full stomach or empty, with plenty or little. I am certainly not telling you that you need to read the Bible in a year. While that is a great thing to do, that is too much to ask of many people. It was what I needed and keep in mind that I did not do it alone. My brother Jeff and my friend (and brother) Joe joined me in 2007; that was simply the start for me. The Scriptures came alive as did my soul. Along with the reading, my prayer life slowly started to develop. But at the start, I had very simple, short prayers as I was reading. These prayers went something like this “Lord, I want to know you more, please reveal yourself to me.” That simple. Learn to be flexible, if you’re rigid, you’ll break and not be useful! Tell Him that you desire more of Him, and just keep your mind open and do not be “set in your ways”. If you are truly ready for change, He will set things in motion to make that happen. So after praying these prayers do not expect your circumstances to get better, but expect to be drawn closer to Him. As you draw closer to Him there will be “growing pains” and there is a great purpose behind them as they are for your good. and you will harvest a crop of love. That being said, Paul had this to say and I encourage you to study these verses and meditate on them throughout your day. Reading the Word is “doing what is good” and there is no better way to love your neighbor than to draw near to God. Galatians 6: 7 Don’t be misled—you cannot mock the justice of God. You will always harvest what you plant. 8Those who live only to satisfy their own sinful nature will harvest decay and death from that sinful nature. But those who live to please the Spirit will harvest everlasting life from the Spirit. 9 So let’s not get tired of doing what is good. At just the right time we will reap a harvest of blessing if we don’t give up. 10 Therefore, whenever we have the opportunity, we should do good to everyone—especially to those in the family of faith. How will you respond to Him? Click here to create your own Bible Reading Plan!